DINE-AGLOW DIABLO™ Food Service Fuels is the only manufacture that offers a FOREVER FREE TABLE LAMP PROGRAM™ to restaurants and catering businesses. Free decorative table lamps forever…, no one else in the entire industry can make this claim! The program is simple and easy! With the Forever Free Table Lamp Program™ there are no restrictions. There are no special promotion dates, limited-time offers or hidden fees. There are no limitations on lamp styles or designs. With the Dine-Aglow Diablo Forever Free Table Lamp Program™, you can get your decorative table lamps for free all year long, without hassles or surprises! Never before has any manufacture ever offered FREE Decorative Table Lamps without any restrictions of any kind! 1. There are zero limitations. Restaurants, caterers and whoever has the need for decorative table lamps uses the secure website at dadfuels.com to purchase any lamp from our large selection of lamps. Your selection of lamps will immediately be packed and shipped to your location of choice. 2. 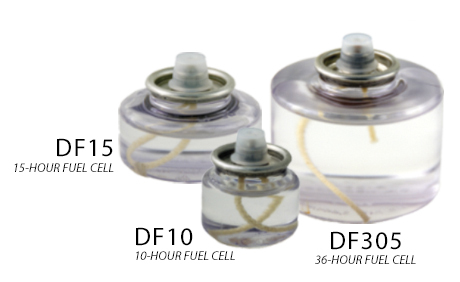 Purchase the corresponding approved Dine-Aglow Liquid Wax Fuel Cell; DF10, DF15 or DF305 (see Fig1), from your distributor. Approved Dine-Aglow Liquid Wax Fuel Cells are the 10-Hour DF10 Liquid Wax Fuel Cell, the 15-Hour DF15 Liquid Wax Fuel Cell and the 36-Hour DF305 Liquid Wax Fuel Cell. If you don’t know where to purchase Dine-Aglow Liquid Wax Fuel Cells, you can contact Dine-Aglow Diablo Foodservice Fuels directly at 1-800-LAMP-LTD and a representative will help you find a distributor in your area. 3. Redeem vouchers which are printed on every case of approved Dine-Aglow fuel; DF10, DF15 and DF305. 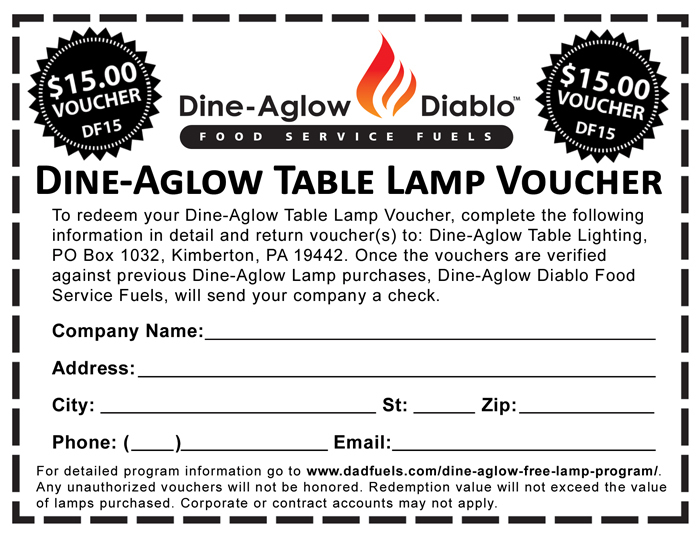 (see Fig2 for sample) Simply clip and mail the authorized “Lamp Voucher®” into Dine-Aglow for redemption. Dine-Aglow will reimburse up to the full value of lamp purchases made. Once purchases are verified Dine-Aglow will send a check directly to the customer. HINT: Once the full value of initial lamp purchase has been refunded, customers are encouraged to continue to clip and save the vouchers for future lamp replacements, expansion plans or to a change to a new lamp design. When additional lamps are needed, simply go back to www.dadfuels.com and repeat the steps above. Simple, Easy and Forever Free!